I’m getting accustomed to premium skincare coming packaged with scoops and spatulas for precise dosage application, but I’ve never before used anything quite as technical looking as this one! 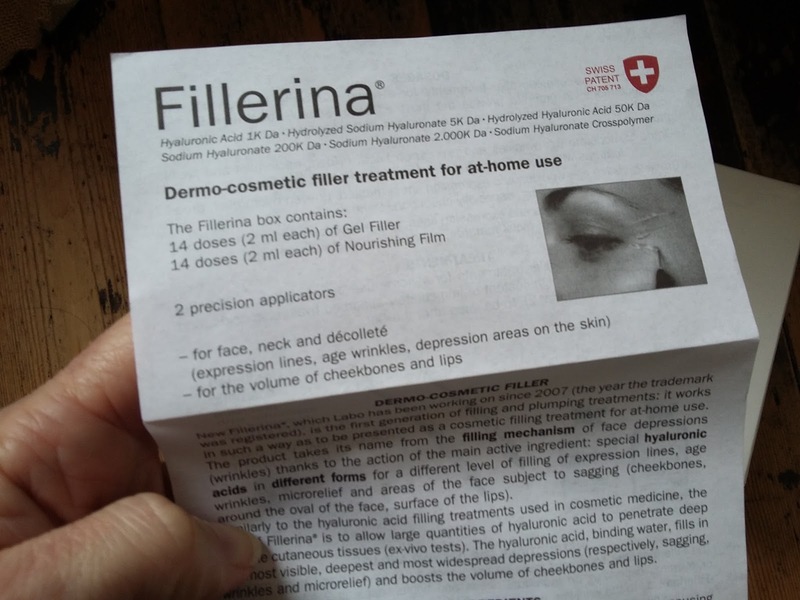 The Fillerina Dermo-Cosmetic Filler is a home treatment designed to plump lines and wrinkles in just 14 days. 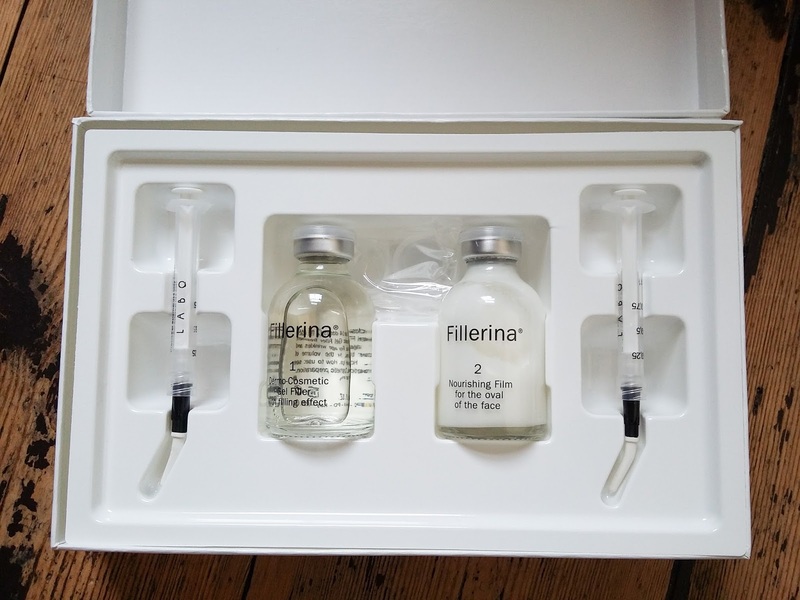 It comes with two bottles of formula (a hyaluronic acid-infused gel and a rich moisturising film), plus two syringes – non injecting, I hasten to add, for those with a phobia of needles! The syringes are used for drawing up an exact amount of both the gel and the moisturiser, and for precise application of the gel in to lines and other areas you wish to fill and plump, such as cheekbones, nasolabial folds and the area around the lips. There are three strengths of treatment available: grade 1 for moderate wrinkles; grade 2 for visible; and grade 3 for deep lines and skin with significant volume loss. In all three cases the key actives are held in the gel, which contains six different types of hyaluronic acids with different molecular weights and structures. Combined, these have plumping and filling actions on the various layers of the skin. If you’re familiar with hyaluronic acid (and that is probably a fair number of you, as it remains such a star ingredient of both topical creams and injectables), you may know that not all face creams containing it are the same. How effective they are is down in part to the types and structures of the hyaluronic acids contained within. I’ve just finished testing the Fillerina Grade 3 system for 14 days. 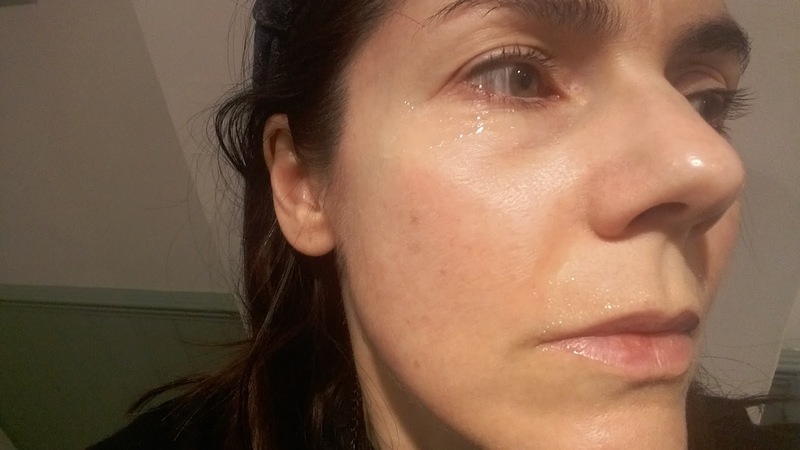 Treatment is more involved than slapping on regular serums and face creams, but it’s not fiddly – you need to set aside about 15 minutes each morning or evening to do it. Remove the disposable rubber seals (it comes with separate plastic caps for ongoing storage), and draw up 1ml of gel. Apply this to the areas you wish to treat - the syringes have a truncated tip for easy application. I applied to my forehead, crow’s feet, nasolabial folds and the area around the lips. Leave the gel to work for 10 minutes (minimal facial movement is advised during this process), then gently push any excess product into the skin using the balls of the hands. Next, draw up 1ml-2ml of the moisturising film and apply over the face and neck. So, as you can see, application is quite straight forward - it just takes a bit of time. A few things of note: my skin felt tingly after I applied the gel (reactions like this normally reassure me that something is working), and I had quite a bit of surface residue. The latter can happen when you’ve used more gel than the skin needs. In which case, remove the excess with your fingers and slightly reduce the amount of gel used next time. Also, I found drawing up the moisturiser tricky. The film is thick and wants to coat the outside of the syringe as well as the inside, but as long as you’re applying around 1ml you’ll be fine. I should also mention that if you have oily/acne prone skin, you may want to skip using the cream altogether. Which brings me on to my own little breakout. After eight days of treatment my skin, which is dry and rarely spot prone, developed a few pimples. I waited two days for the skin to calm down, and then resumed treatment. For the record, key ingredients in the moisturising film include meadowfoam seed oil, vitamin E and shea butter, tree fern extract and salicylic acid. 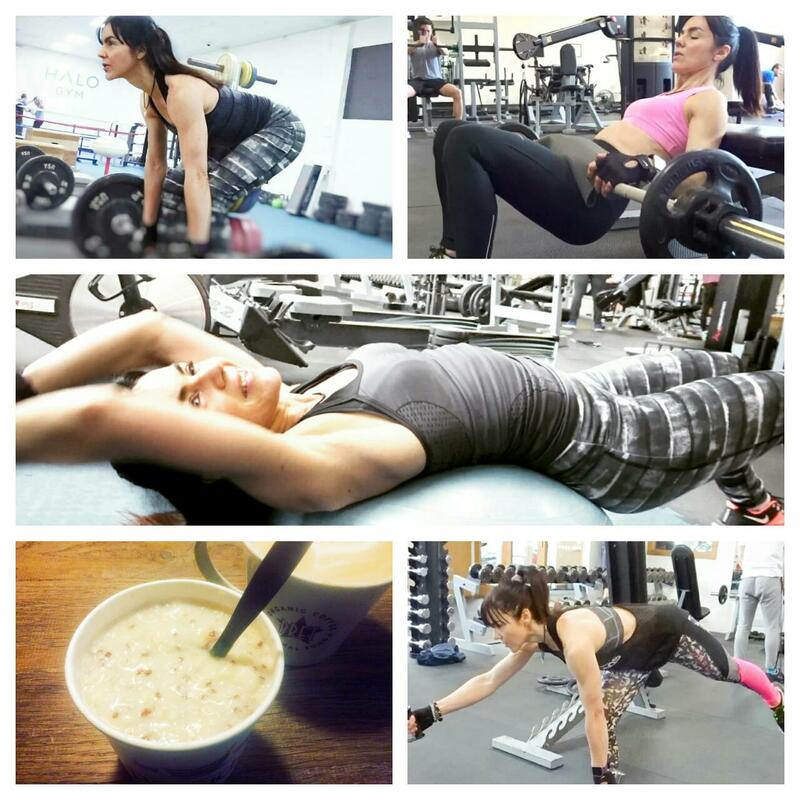 Fillerina strongly advises drinking two glasses of water before application, plus at least 2L a day. I’ve never much liked the taste of water and so struggled with this bit, but there are plenty of studies to suggest that any type of fluid can count towards the daily recommended amount (though not alcohol, obviously), and remember that fruit and vegetables are also excellent sources of water. Anecdotally, from knowing my own face, I can see a subtle reduction to the fine lines around my eyes (I don’t have deep wrinkles). There’s also been some plumping to the line between my brows and to my nasolabial folds. I’ve included before and after shots, although I don’t always find these terribly useful as it’s impossible to replicate lighting and head angles exactly. I’m really pleased with the results. 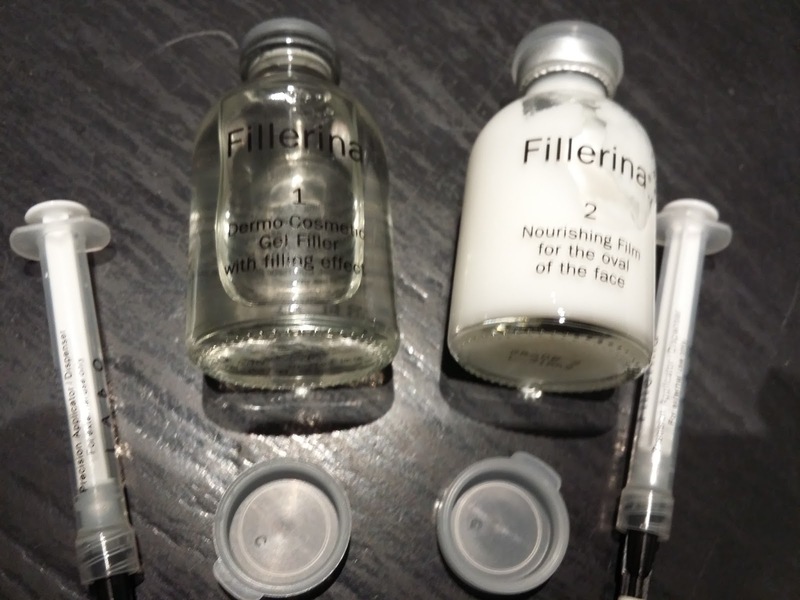 If you don’t want to go down the in-clinic injectables route but are looking for something more potent than standard serums and face creams, the Fillerina 14-day treatment is a good option to try. 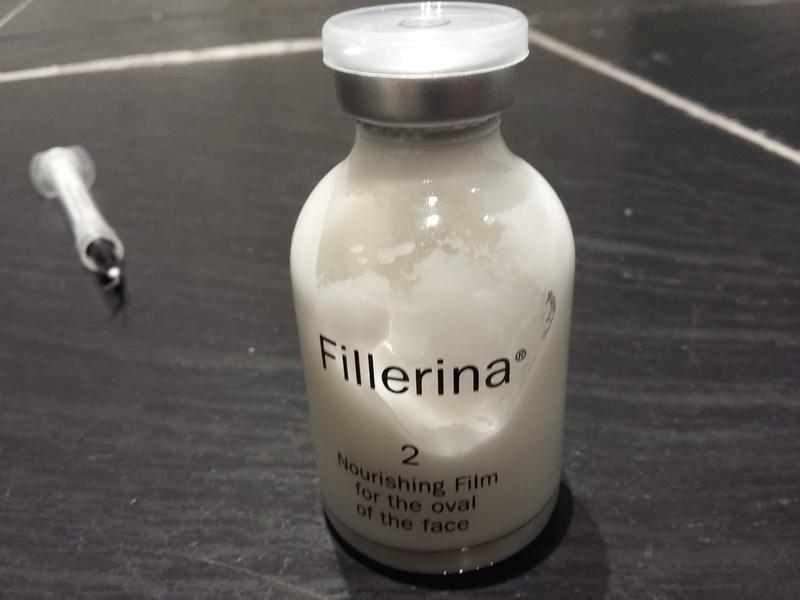 Fillerina is offering readers a 20% discount on the cost the 14-day filler treatment. Grade 1 is priced £79, Grade 2 £89 and Grade 3 £95. Apply the code *Face Up Beauty* at checkout here. This looks a bit technical for me but I can really see the results! I also love the idea of taking some time out of my day to look after my skin. I really like the sound of doing something like this at home rather than going to a salon and the idea of avoiding injections sounds fab too. This seems to be a great filler, dear Tracey! You are right about pictures, it's difficult to really see the improvement sometimes, but I could see it here! Obviously you don't have wrinkles, but I saw something, I don't know whether plumping, but it seems that your skin got "shinier", brighter, in a positive way, I mean. Don't know how to express myself, but I liked the result! 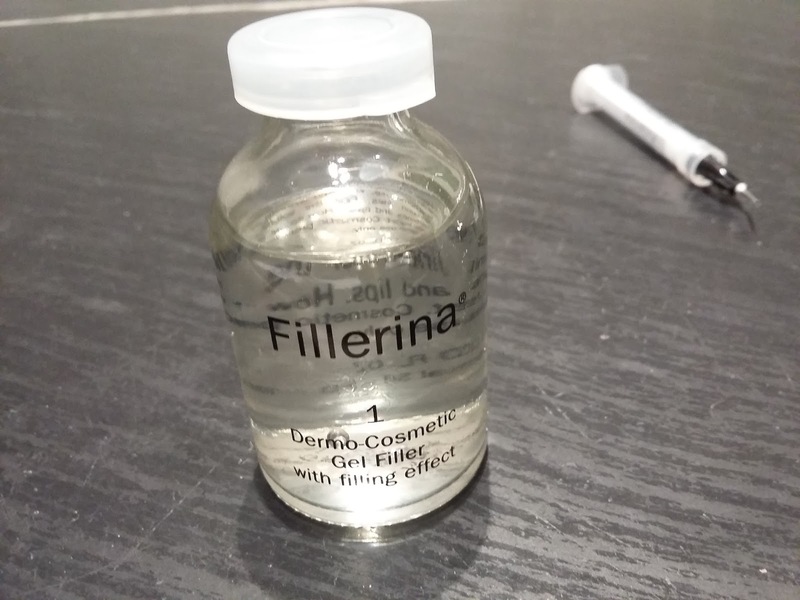 This Fillerina Filler with hyaluronic acid scared me when I saw the syringe, then you said it's not injectable :) Good! I liked the process, the 10 min without "expression" could be used for meditating as well. The downside would be to have some spots after some days... but well, it seems to be a good product anyway and with a discount now, simply great! Hope you have a very nice day, dear Tracey, hugs! I think I would be too scared to actually do this, but it is good you can see results from the treatment.